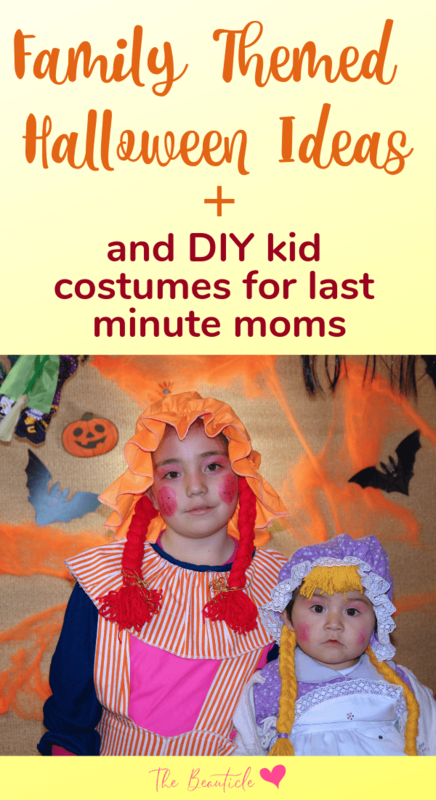 Looking for family themed Halloween costume ideas or DIY kids costumes? You’re in the right place. Here are some Halloween kid costumes that you can whip up in no time with items you probably already have in your house. If you want to go to a party or trick-or-treating as a family, you might be looking for possible family-themed costume ideas. There are a variety of costumes that allow the entire family to fit within a single theme, no matter the number of people in your family or the ages of your kids. Here are just a few of the many fun ideas you have to choose from. When thinking about a family Halloween costume idea, try to think of any movies or television shows where there are multiple characters you can make a costume out of. The Wizard of Oz is perfect because there are a lot of characters to choose from. Whether you have a small or large family, it should work great! If you have a baby, you can go as Dorothy, your husband can pick either Scarecrow, the Lion or the Tinman, and the baby can be dressed as toto the dog. If you have a dog, he can be Toto, and your kids can dress as other characters or even as the witch to mix it up a little. Here are Wizard of Oz costumes for adults and the costumes for kids. A very popular Disney animated movie is Aladdin, even decades later. This is a fun movie with lots of characters that the family can dress up as. For example, you can dress as Jasmine and Aladdin, while the kids dress as the Genie and Abu. Some people also like going the other direction and mixing up Aladdin and Jasmine with some of the evil characters like Jafar. This mixes it up and keeps the costumes entertaining. For a dog or baby, you might even find a magic lamp costume. Here are some Aladdin costumes for the whole family and the cutest little monkey costume for babies. Superheroes never seem to go out of style, and instead keep getting more and more popular. There are tons of ways to do a superhero family costume. Each person can dress as their own superhero, even if they are supposed to be in different universes. You can go as a superhero group, such as The Avengers, or you can even find a superhero movie with an actual family, like The Incredibles. Here’s a wide array of superhero costumes to choose from. Why not go with a Willy Wonky theme? This is a timeless story that creates some really fun costumes. You can go as Willy Wonka, Charlie and some of the other kids, but there are other ways to do it. Perhaps a fun option is to go as Willy Wonka, a Wonka bar and an Oompa Loompa. Here are some great Willy Wonka costumes and accessories. Remember that anything you can make into a group of characters is easy to turn into a family Halloween costume everyone will love. Even as simple as a fruit salad where everyone dresses as their favorite fruit. Making costumes for your kids not only saves money, but it allows you to make a unique costume you won’t be able to find in any store. It gives you the opportunity to be creative and make a one-of-a-kind costume for your kids. It’s also a great way to get creative with your children by making memories and family traditions. These are some ideas for DIY Halloween costumes for kids. If you have a kid that is adventurous and doesn’t mind having some fun with his costume, they might love to wear a spaghetti and meatballs costume! This is also easy to make on your own from home if you don’t want to buy a costume. What you need is a red-checkered tablecloth that you can turn into a poncho. You will then glue white yarn to large paper plates so that it looks like spaghetti. Small foam balls that have been painted a brown color will be the meatballs. These are also glued to the spaghetti. Red paint can create dripping tomato sauce on the tablecloth. Glue the plate, spaghetti, and meatballs all to the front of the tablecloth costume. Give your kid a big pot to wear on his head like a hat. This is actually a very easy costume to make for kids, though to others it will look very complicated. All you really need to make a fairy dress is a tutu skirt that is long enough for them to wear as a little dress. Get a belt, preferably some type of floral one, and wrap it around the tutu dress at their waist, and it instantly transforms it. You can then add a ribbon around the halter, then of course don’t forget to make the paper wings! Put her in tights and add a halo to your head if you like. Another food-themed Halloween costume that can be a lot of fun is to make an ice cream cone costume. For this costume, you are going to use a tutu again. If you don’t have a tutu that is an ice cream cone color, you could always just use chiffon in any off-white shade. Have your kid wear a white top and create large rainbow-colored sprinkles to attach or paint on the top. Make them a hat with a big cherry on top, and the costume is done. If you are pressed for time and just need to make a quick costume, this is perfect. It is based on the term ‘It’s raining cats and dogs’. You just need a kids’ size umbrella that you can attach pictures of cats and dogs to. Once you do that, all that is needed is to put them in a fun outfit, such as a raincoat and rain boots as if they are out in the rain while it is raining cats and dogs onto the umbrella. Enjoy these DIY Halloween costumes for kids and be safe when out trick or treating as a family with these tips.